‘Star Trek 3’s Patrick McKay, J.D. Payne To Rewrite L. Frank Baum’s ‘Winter’s Knight’ Sony Pictures is making a deal with Star Trek 3 writers Patrick McKay and J.D. Payne to rewrite Winter’s Knight, a tentpole hopeful that the studio is fast-tracking in hopes of getting helmers Joachin Ronning and Espen Sandberg to direct it after they complete Pirates Of The Caribbean: Dead Men Tell No Tales. That film began production two weeks ago. Winter’s Knight is a Viking-mythology-tinged origin story of St. Nick and Christmas, based on Wizard Of Oz author L. Frank Baum’s 1902 public domain book The Life And Adventures Of Santa Claus. The project sold in a whopping $1 million spec sale for newbie scribes Ben Lustig and Jake Thornton, an auction fueled by the concept and the fact that Ronning and Sandberg were attached and so high on it. Marc Platt and Lawrence Grey are producing and production president Michael De Luca brought it in. Now, the priority is to get it into production later this year. 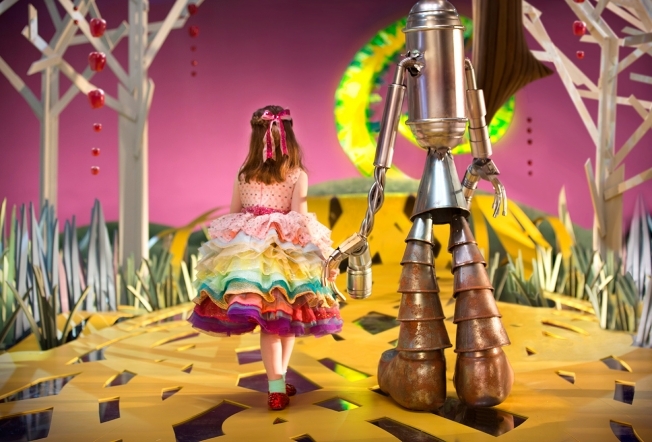 The Wizard of Oz: GS&P N.Y.’s seamless mix of craft and emotion The beautiful 60-second spot from Comcast tells the story of Emily, a 7-year-old girl who was born blind. Comcast asked Emily to describe what she sees in her mind’s eye when she watches The Wizard of Oz—and then the company built that version for her, using skilled set and puppet designers and makeup artists. The ad goes on to explain that people with visual disabilities can get more out of watching TV with Comcast’s “talking guide.” Developed by the Comcast Accessibility Lab, it includes voice guidance and one-touch access to closed captioning—and is part of Comcast’s commitment to helping people with disabilities enjoy entertainment. Two-time Academy Award winner Robert Redford delivers the voiceover at the end. Local Musician Produces Music for Wizard of Oz Sequel Chris Orazi, an award-winning composer, producer, and founder of C.A.S. Music Productions in Vineland composed 15 brand new songs that will be featured in Wizard of Oz’s sequel, Welcome Back to Oz: The Patchwork Girl at Delaware Children’s Theatre this March. “Of all the projects I’ve worked on over the last 30 years, this one has inspired me in new and different ways,” says Orazi. “Unlike other children shows I’ve written for in the past, this one’s music rocks.” The musical is inspired by the book, The Wonderful Wizard of Oz written by L. Frank Baum and is set in Oz’s Emerald City. Original characters Dorothy, Tin Man, Lion, and Scarecrow will be joined by two new heroines, Ojo, a lovable munchkin, and Scraps, her rag doll who comes to life. Dorothy leads her friends on a quest to help find Glinda the Good Witch so she can stop the Wicked Witch from practicing forbidden magic. Along the way, Dorothy meets classic L. Frank Baum characters including Wogglebug, the Nome King, and the Rainbow’s daughter. Welcome Back to Oz: The Patchwork Girl premieres on Saturday, March 7th at 2 pm and performances will continue throughout the month of March on Saturdays and Sundays at 2pm. On Friday, March 20th, there will be a special performance at 7:30 pm. Cable Shows Are Sped Up: Munchkin voices get higher in ‘Wizard of Oz’ to Squeeze in More Ads When Stephen Cox was watching “The Wizard of Oz” on TBS last November, something didn’t sound quite right to him about the Munchkins, who are near and dear to his heart. “Their voices were raised a notch,” said Mr. Cox, the author of several pop- culture books including one about the classic 1939 film. “It was astounding to me.” He wasn’t imagining things. Time Warner Inc. ’s TBS used compression technology to speed up the movie. The purpose: stuffing in more TV commercials. As they contend with steep ratings declines, many top cable networks are jamming more ads into programming to meet audience guarantees made to advertisers and prop up revenue despite falling ad prices. TV Review: SUPERNATURAL – Season 10 – “There’s No Place Like Home” The Wizard turning out to be somebody’s bad side is also an intriguing tweak, as is Charlie’s method of reuniting herself. It’s fun to have some honest-to-Pete plot twists, and a reference to Dean and Sam as Rocket and Groot does not go amiss. The “you had it in you the whole time” theme is of course a huge part of the OZ movie mythology that’s been with us now for nearly eight decades now, and it resonates wonderfully with SUPERNATURAL’s ethos. There’s no place like home inside yourself, indeed. 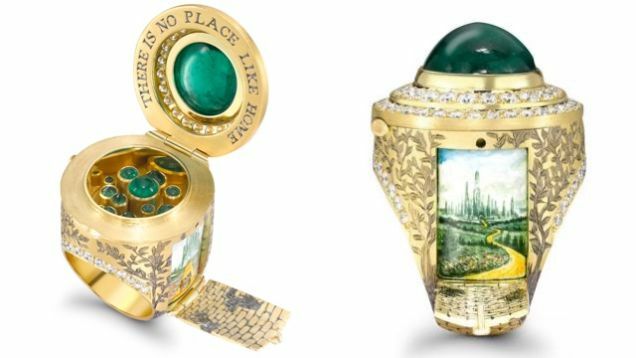 Images From Famous Books Hide In The Secret Compartments Of These Rings There is more to jewelry designer Theo Fennell‘s rings than meets the eye. Many of his piece contain secret compartments and hidden paintings, paying tribute to books like The Wind in the Willows, The Lion, the Witch, and the Wardrobe, and The Wizard of Oz. Up top, you can see Fennell’s Wizard of Oz ring, which contains a secret Emerald City inside. 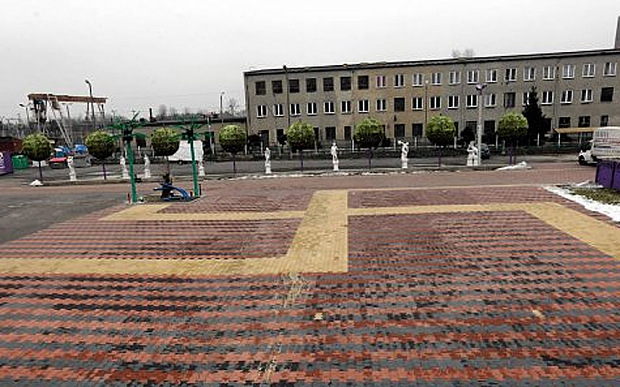 Outside, you can fold down the side of the ring to reveal a Yellow Brick Road leading up to another, painted Emerald City. The Lion, the Witch, and the Wardrobe ring opens onto an ordinary wardrobe on one side, and onto Narnia on the other. 7th annual Royal Historian of Oz Writing Contest Oz-Stravaganza! 2015 themed “Oz ShowStoppers” is being held June 5th – 7th in Chittenango, NY, the birthplace of Oz. The 7th annual Royal Historian of Oz Writing Contest is currently underway and is open to students in fourth grade through adult. There are 5 age divisions.Teachers are encouraged to have their students enter the contest. Prizes will be awarded to the top 4 entries in each age division. Oz-Stravaganza! information is updated often at http://www.oz-stravaganza.com. Out singer Kenyth Mogan has a new music video debuting this Valentine’s Day that puts a gay love story twist on The Wizard of Oz. The song and video are pretty fantastic. You might also recognize the video’s Tin Man love interest as Ronnie Kroell of Playgirl and Make Me A Supermodel fame. Videogames and the Oscars The Wizard of Oz was first adapted as an action game for the Super Nintendo by the Seta Corporation. 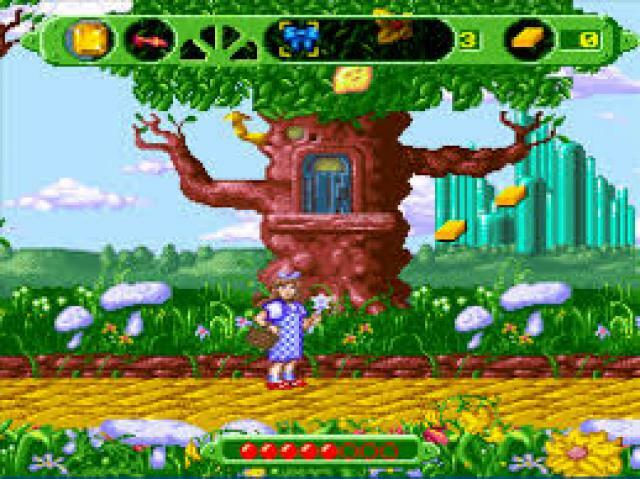 In the game you controlled the four main characters and used their different abilities to rescue Toto from the Wicked Witch of the West and reach the titular Wizard of Oz so that Dorothy could return home. A more recent title was released on the Nintendo DS, called The Wizard of Oz: Beyond the Yellow Brick Road. This was a turn based RPG in the vein of the Dragon Quest or Earthbound series. Although it is technically licensed from the original novel, rather than the film, it does little to step out of the 1939 film’s shadow. The game received better than expected reviews for a licensed game, but that still only equated to average aggregate scores. It was cited as being too simplistic for RPG enthusiasts, but its unique visuals and good use of the DS touchscreen earned it some positive reviews. 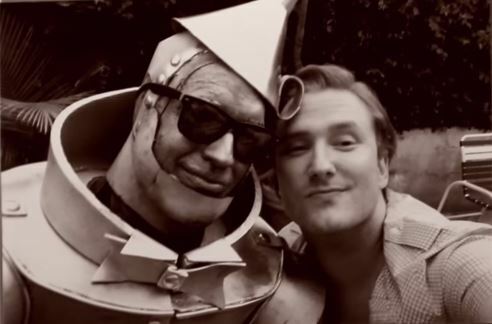 How Creepy Is ‘Return to Oz?’ We’ve Got the Visual Proof Did you ever watch The Wizard of Oz and feel it was missing something? Like post-apocalyptic rubble, primitive electroshock machines, or screaming disembodied heads? 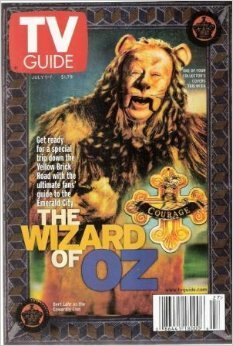 You’ll find all of these and more in Return to Oz, Disney’s 1985 film based loosely on author L. Frank Baum’s Wizard of Oz sequels. It didn’t pay off: Return to Oz was a critical and box office failure. But for a young generation who watched the film on VHS, Return to Oz was a formative, nightmare-inducing experience. Thirty years later, the film retains a certain charm, but is still a jarring contrast to cheerful Munchkin-filled Oz embedded in our collective consciousness. See the ‘Wizard of Oz’ Flying Monkeys Up Close Several of the primate parts were played by real people: Nikko, the head monkey, was played by actor Pat Walshe, while vaudevillian actor Harry Monty was both a Munchkin and a monkey. But in the creepy scene where thousands of monkeys descend upon our heroes in the Haunted Forest, the monkeys were all tiny rubber figures no more than a few inches tall. The figures were hung from a gantry car with four strands of extremely thin music wire, resulting in about 1100 wires total. As the gantry moved down the soundstage, it took all of the little monkeys with it, making it appear as if they were flying. That’s about 275 tiny little winged monkeys in all—but according to the Oz museum in Wamego, Kansas, only four of these models survive to this day. They have two of them.